A woman places shoes in memory of those killed by Hurricane Maria in front of the Puerto Rico Capitol, in San Juan. A study released last week by researchers from Harvard had lots of important things to say about life and death in Puerto Rico after Hurricane Maria. In the weeks and months after the storm, hospitals were overwhelmed, pharmacies were low on drugs, and households went without clean water and electricity. The devastation of the island’s health care infrastructure likely led to hundreds of deaths. But that number is not a count of the death toll in Puerto Rico caused by Hurricane Maria. Instead, it’s just the midpoint of a wide-ranging estimate of the possible number of deaths; the full range goes from 793 to 8,498 people. What that estimate means — that if you randomly sampled households over and over, 95 percent of the ranges extrapolated from those surveys would include the actual death count — doesn’t easily lend itself to headlines. And in focusing on that single number, news stories often overlooked much of the qualitative information about how people died. Here’s how the Harvard study worked: In January and February of 2018, researchers surveyed more than 3,000 randomly selected households across Puerto Rico and asked residents how many people from those households had died in the months after the storm made landfall. They found 38 deaths1 in those 3,300 households, and they used that figure to calculate a mortality rate, which was compared to the mortality rate from the same time the previous year, before the storm hit. The difference was then used to come up with a very broad estimate for the number of people who died above what you’d expect to see in a normal year. The Harvard study is not the only attempt to measure the toll on the island, and each has its own quirks and timelines. The Center for Investigative Journalism in Puerto Rico calculated around 1,000 excess deaths from Sept. 20, 2017, when the hurricane swept through the islands, through the end of October, as did the New York Times and researchers working with Penn State.2 Professors at the University of Puerto Rico-Mayagüez estimated somewhere between 605 and 1,039 additional deaths during that time. The Harvard study covered a longer period than the others– through the end of the year — and suggested that the number of deaths was elevated for months after the storm. 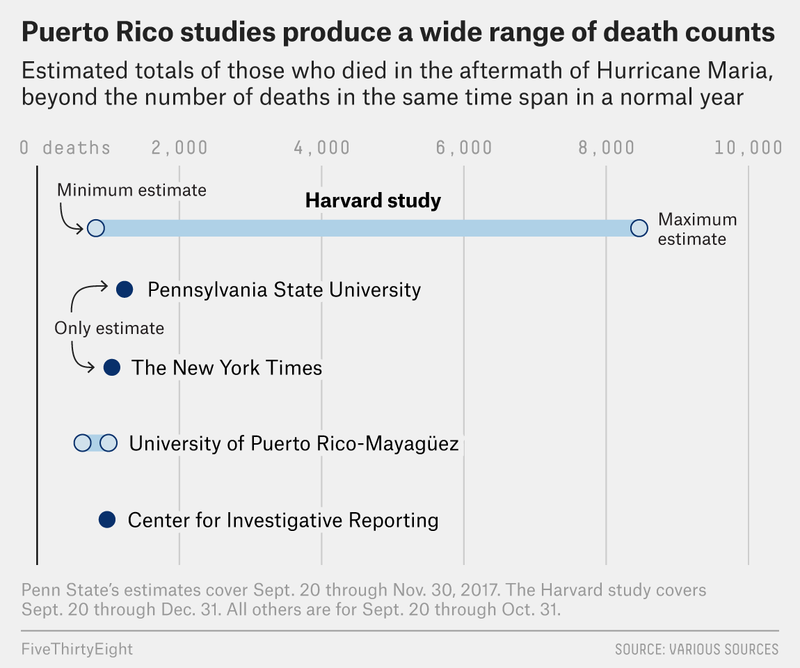 Despite the different numbers, there is a clear takeaway from all these studies: a lot of people died after Hurricane Maria. Even the lowest bounds of the Harvard estimate would be more than 12 times the official death toll of 64 and would make Hurricane Maria one of the deadliest natural disasters in U.S. history. And that’s not including the deaths in other countries and U.S. territories, such as the U.S. Virgin Islands, whose infrastructure was also devastated by the storm. The Puerto Rican government has frequently acknowledged that it needs to improve its own count.3 In the face of intense criticism of its official statistics, the government commissioned a study from researchers at George Washington University, supplying them with official death records and other data, which should be available later this summer. What happens if GWU finds the death count is closer to 1,000 or 1,500, as other studies have estimated? It would be thousands of fewer deaths than was widely reported in the news, but it would be well within the estimates made by the Harvard researchers. And estimates along those lines would still mean the disaster was of epic proportions and resulted in many deaths that likely could have been prevented. The authors of the Harvard study are well aware of its limitations, which is why they didn’t include the 4,645 figure in the headline of their press release, and also why they made sure that the range of estimates was front and center in all communication, said Rafael Irizarry, a Harvard biostatistician who was a co-author on the paper. But the true number? That’s not something that could come from the Harvard research, said Irizarry. The house-to-house survey only allows for a broad range of estimated deaths. It does suggest that deaths remained high for months after the storm, after the time period covered by previous media outlets and researchers. But perhaps the most important contribution of this study is the information surveyors gathered on how difficult it was to access basic health care services after the storm and how consequential that lack of access may have been. About a third of the deaths documented by the survey were caused by an interruption of medical services. And in addition to those who died, many more people faced trouble getting care. Fifteen percent of households in the survey said they had trouble getting medicine, and around 10 percent had trouble using breathing equipment. Now, with hurricane season already underway and the infrastructure for both Puerto Rico the U.S. Virgin Islands still in bad shape, perhaps the most important takeaway from the study is that the islands are facing a lot more potential death if there isn’t a faster, stronger response to storms in the future. Between Sept. 20, 2017, when Maria hit the island, and Dec. 31, 2017. One of the researchers is a professor at Penn State. The other, Jeffrey T. Howard, is independent. Puerto Rico’s governor, Ricardo Rosselló, has said publicly that the protocol for creating the official tally is very limited and produces low numbers. And late Friday, in the wake of press coverage of the study and after the Puerto Rican Institute of Statistics announced a lawsuit seeking the release of mortality statistics, the island’s government finally released mortality figures through May of this year.